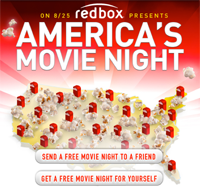 Thursday August 25th, 2011 is America’s Movie Night, and to celebrate Redbox is offering a FREE movie rental code. Click on the tab “get a free movie night for yourself” and Redbox will email you a code good for a FREE DVD movie rental or $1 off a Blue-Ray rental. The code will only be valid on Thursday.